So the Wilderness Trail is one that I have had on my list ever since I bought the book “60 Hikes within 60 Miles: St. Louis”. 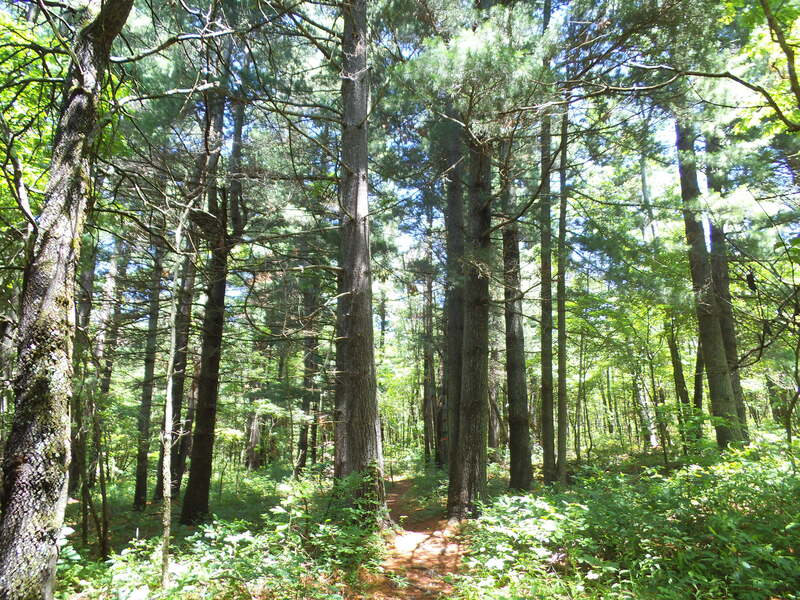 It is an 8.5 mile trail with about a 1 mile connector (if you want to vary your trip), and eight designated backpacking campsites along its route. 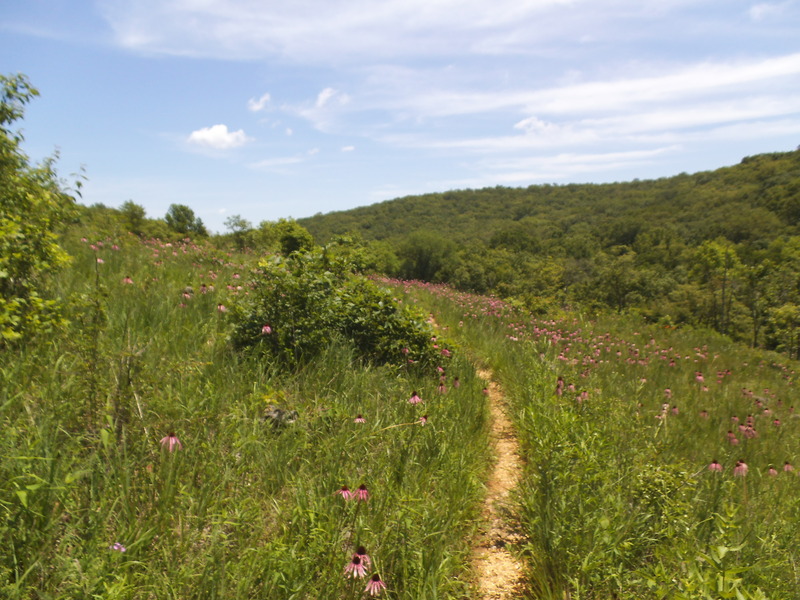 It is long and rugged, and it heads out into the more remote parts of Meramec State Park. I had been debating whether or not to make it an overnight, but after discussing it with Max (the hiking dog) we just decided to make it a day hike. Eight and a half miles? Ain’t nuthin’ but nuthin’! 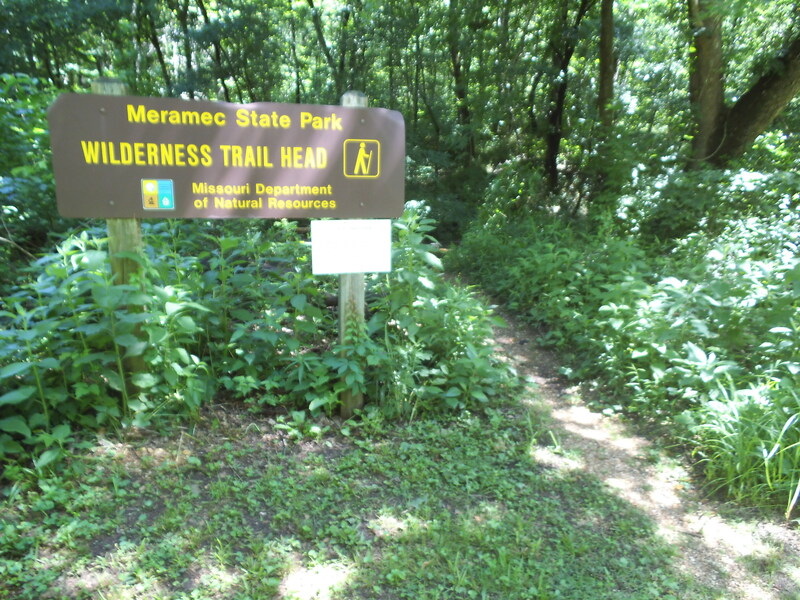 Meramec State Park is in Sullivan, MO, just about one hour southwest on 44 from the 44/270 interchange. Get off at exit 226 in Sullivan, and make a left (south) on 185. In about 3 or 4 miles, the park entrance and visitor’s center will be on your right. Make it a point to stop and check out the visitor’s center and the helpful people inside, and pick yourself up a Map for the Wilderness Trail while you’re in there. When you head out from the trailhead, you will cross the creek there and hike about a third of a mile past the park cabins. Along this section there is a registration box. Due to the length of this trail and the remoteness that it takes you through, I can’t emphasize enough that you should fill out a card, just in case something unthinkable happens while you are out there. A little further down the trail after you hike through a small glade, you come to the fork. I took the path to the right (counter-clockwise), though I think it is traditionally hiked the other direction. The trail treads gently upward until you reach a gravel access road along the top of a ridge. You cross the road, and the trail makes its way down to the bottom on the other side into Deer Hollow and along a creek that was surprisingly dry considering the rain we had recently gotten. It is along this section that you eventually pass the spur to the first backpack camp, just a little ways past a mile from the trailhead, but I must confess that I somehow hiked right past it without seeing it. However, it was around this point that my GPS crapped out on me, so I was a bit distracted. You cross the creek and start hiking up the hill, where in about another three quarters of a mile, you get to the 185 spur that the trail crosses twice. If you were to walk down the 185 spur to the right about a quarter mile, there is a gravel spot in a curve on the road that makes a good parking area if you don’t feel like hiking the whole trail. After you cross the spur road, you move through a pine grove and the trail starts to wind its way down to another creek bottom between the hills. You will pass the connector trail on your left, and then it crosses the creek and hikes along the hillsides to the east. The forest opens up a bit, and you make your way through a series of glades, one of which was filled with about 1000 echinacea flowers. At around three and a half miles, the trails turns to the left around the end of the ridge and you head back west along the north side of the hill. 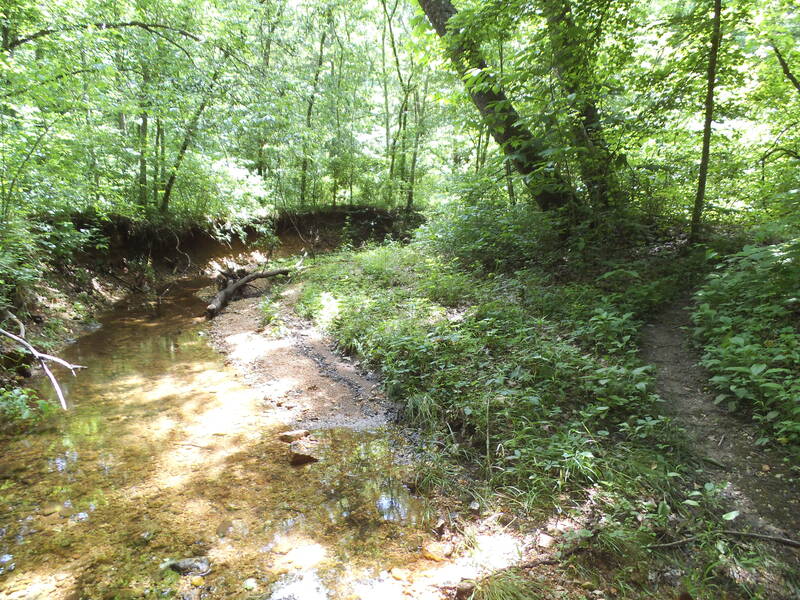 It is at this point, as the trail heads down to the creek, that you get the closest you will to the Meramec River. If you were to hike this trail in the winter, you would probably be able to see it through the trees, but today there was just too much underbrush. You can tell which direction it is though, due to the playful sounds of families and boats down the hill to the right. Copper Hollow Spring is at the bottom of this giant rock face. Once you get to the bottom, the trail crosses a few watersheds and eventually another creek. 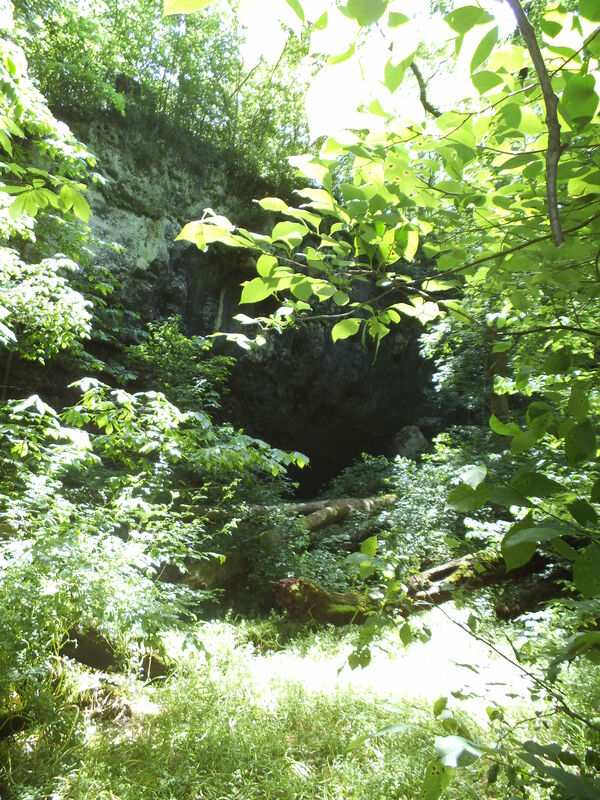 Along this section you will come to Copper Hollow Spring, which gushes out of the bottom of the cliff and into the creek. It’s worth checking out, but the area around it is pretty slippery so watch your step. Returning to the trail, you will wander through Copper Hollow until you come across the next backpacking campsite spur. You are pretty close to the five mile point, and this is a good spot to stop and have some lunch. Along this section, the trail turns widely to the left and travels past two more campsite spurs, and starts to slowly climb the hill in front of you. Toward the end of your ascent, you will hit the steepest spot on the trail, and get up on top of the hill. This upper forest is more open with pines here and there, and it is also where you will pass the spurs to the fifth and sixth backpack campsites, on your right. About another quarter mile along and you hit the other end of the connector trail on your left. Then a half mile or so beyond that down the hill, you hit the 185 spur for the second time. You cross the road and follow the creek through Campbell Hollow for most of this section, hiking across it a number of times as the trail darts back and forth. Just before the eight mile point, you will pass the spurs to the last two campsites, and its just around a half mile back to the trailhead. It is remote. Sure, you put in a couple of miles to get back in there and you are still pretty well surrounded by civilization in the region, but there is a distinct sense of isolation that can be very satisfying depending on your frame of mind. The backpack camps. 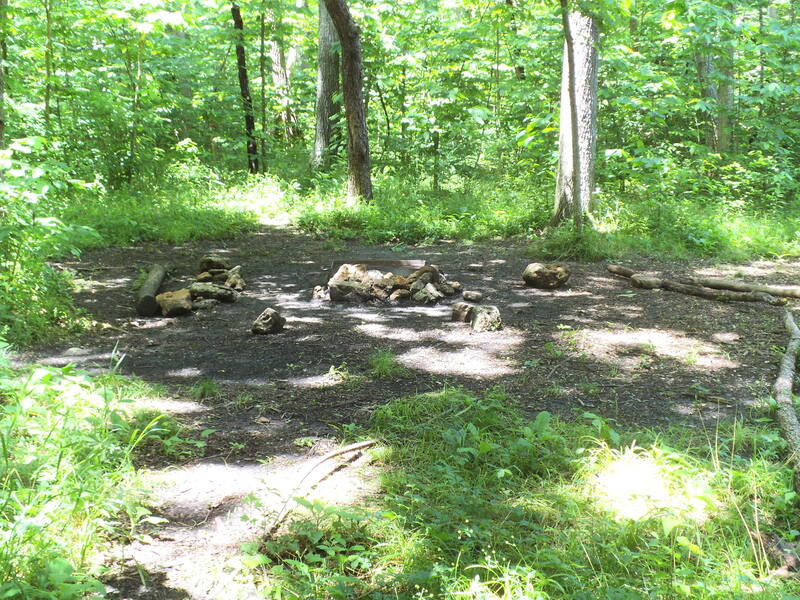 What other trail nearby has so many established campsites with fire rings right there for use? This trail is a great choice for anyone wanting to get into backpacking. I haven’t yet spent a night out there, but I would bet that the forest comes alive with animals. Max and I were there during the day, and we saw five deer. Two of which were bedded down not twenty feet from the trail and got spooked and ran off when we hiked by. It’s so close to home. Just about one hour from my front door. You can’t beat that! Ticks, ticks, and more ticks. Ticks all over Missouri are super bad this year and we “interacted” with quite a few of them on this trail. Make sure you bring your bug spray and your dog has some sort of tick treatment or collar. 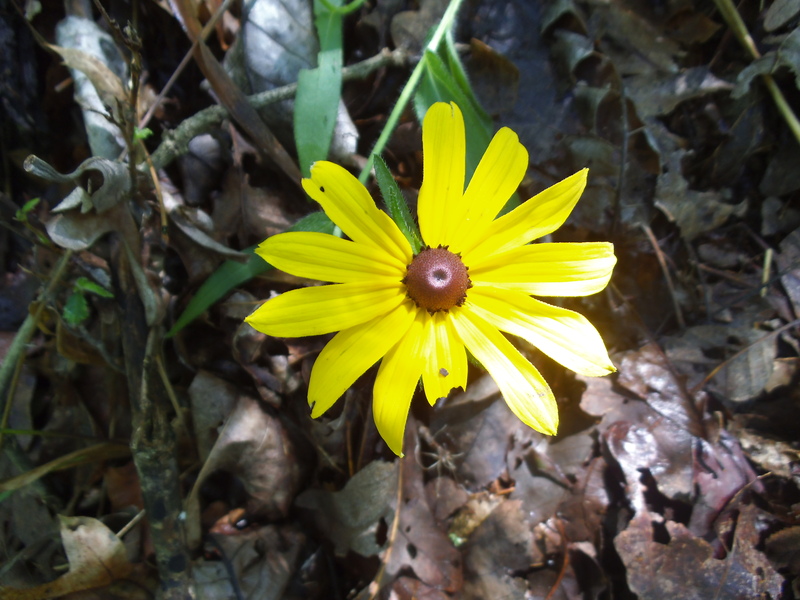 Like any remote trail, the underbrush causes the trail to be really narrow and short at times. There is very little Poison Ivy and quite a lot of its harmless lookalike Fragrant Sumac, so know your three leaved plants so as not to freak out. I like to hike in shorts so I can feel the ticks to pick them off. I can also pretty much instantly spot Poison Ivy so as to avoid it, and I don’t get as hot…but maybe wearing long pants would be a good idea. Also, be prepared to duck from time to time. It’s a great trail to hike, but be ready for the potential challenges. It doesn’t have the most rugged pathway, but due to its length, the amount of fallen-tree-obstructions, and its narrowness at times, I would call this trail difficult. 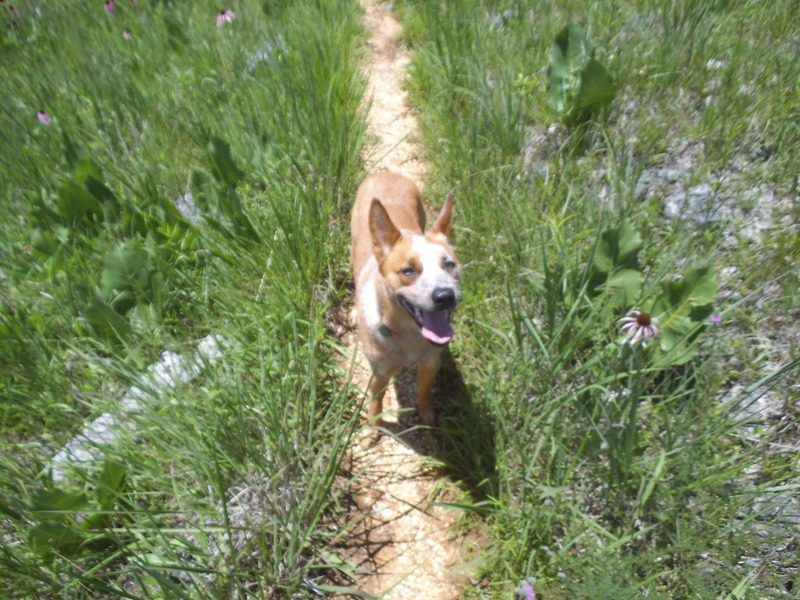 Max and I had a lot of fun and we thoroughly enjoyed the challenge of this trail. I think a late fall backpacking overnight is in order, once the ticks have tapered off and the brush has thinned out. It took us around five and a half hours to complete, but we were stopping a lot to hunt mushrooms and take pictures and just take in all the beautiful wilderness around us. I’m definitely looking forward to the next time I get to hike this trail. I’ll probably never make it down there to hike this trail, but I do enjoy reading about hiking in other parts of the country. « Leaves of Three: Will THAT make me ITCHY?! ?